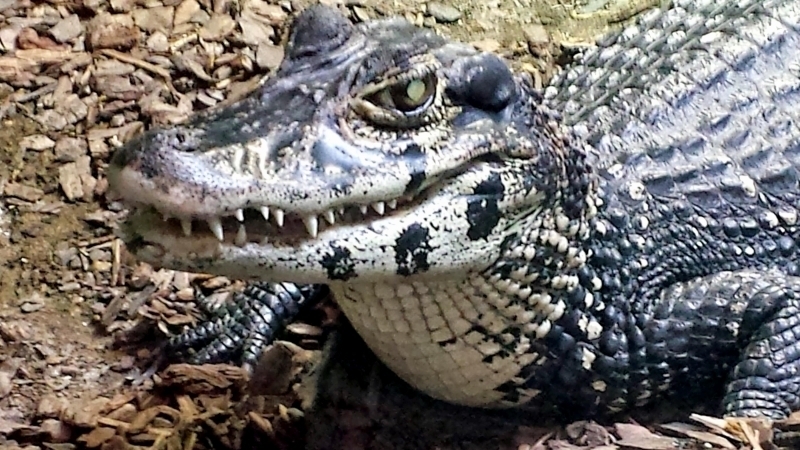 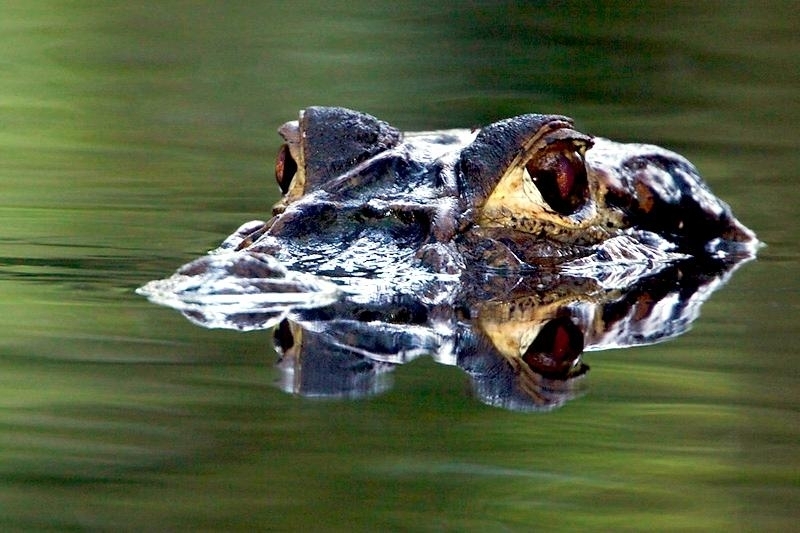 Black Caiman typically hunt at night, using their acute sight and hearing to locate their prey. 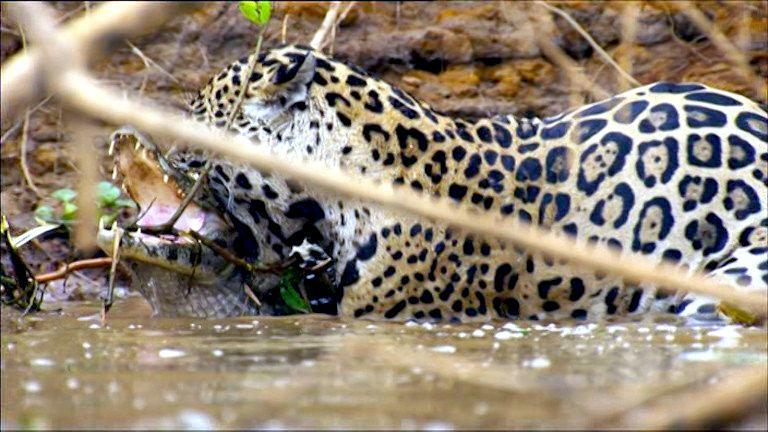 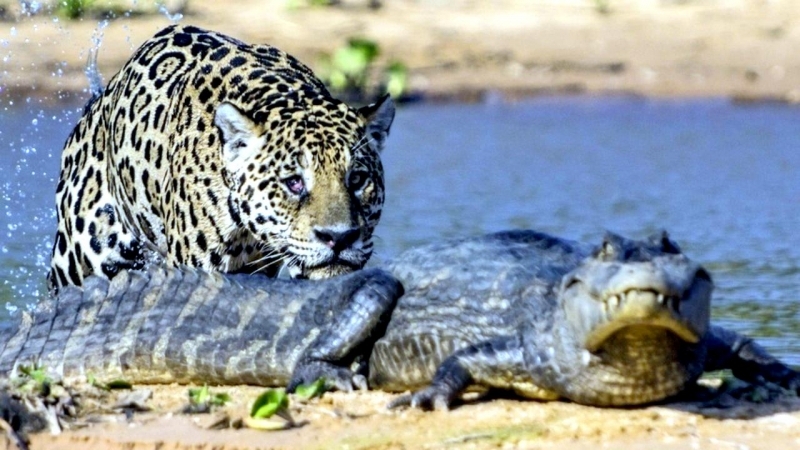 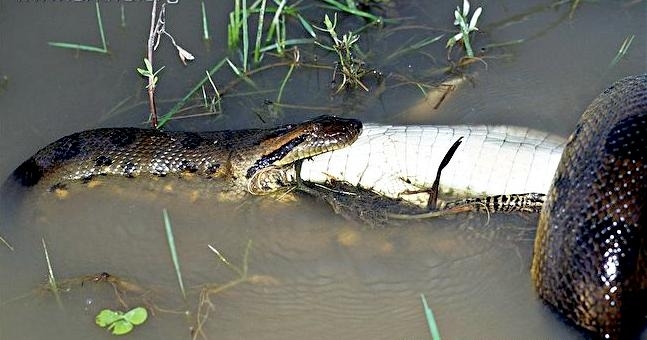 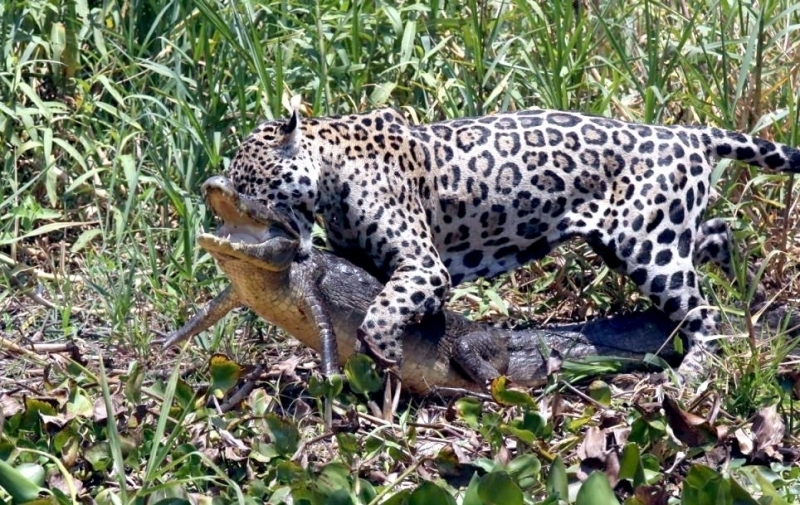 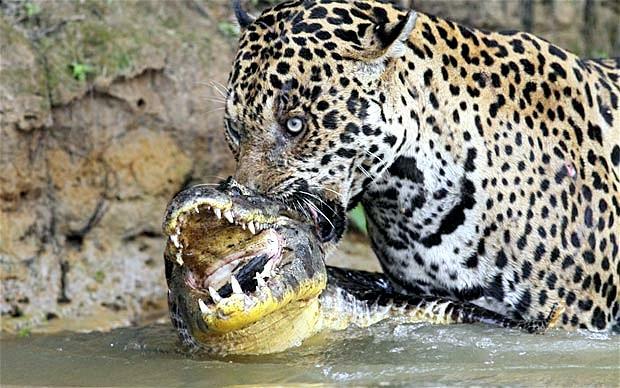 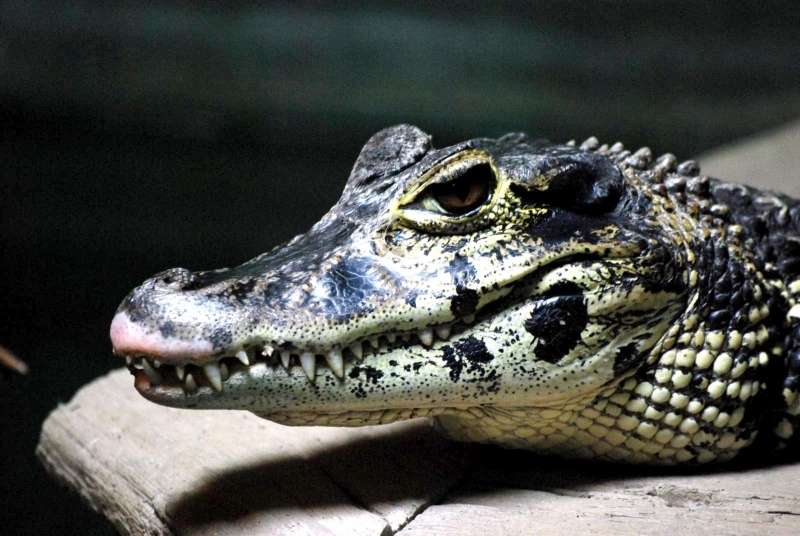 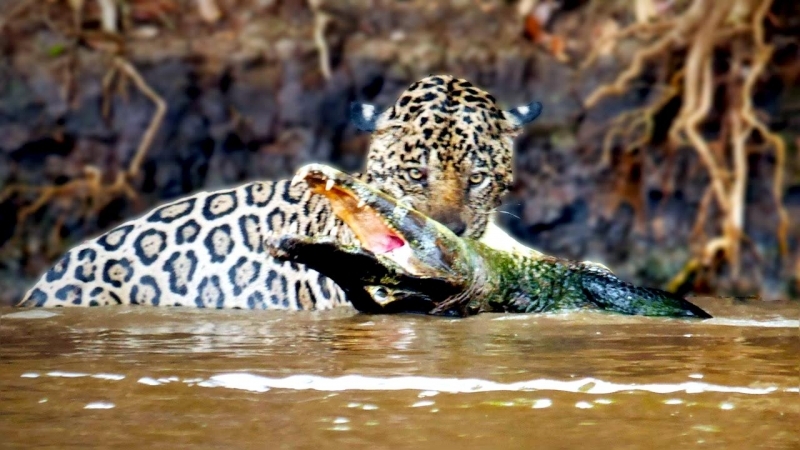 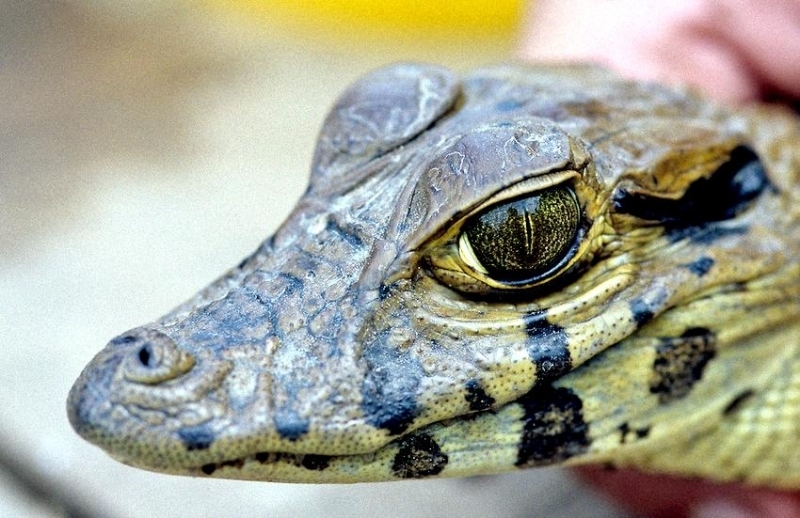 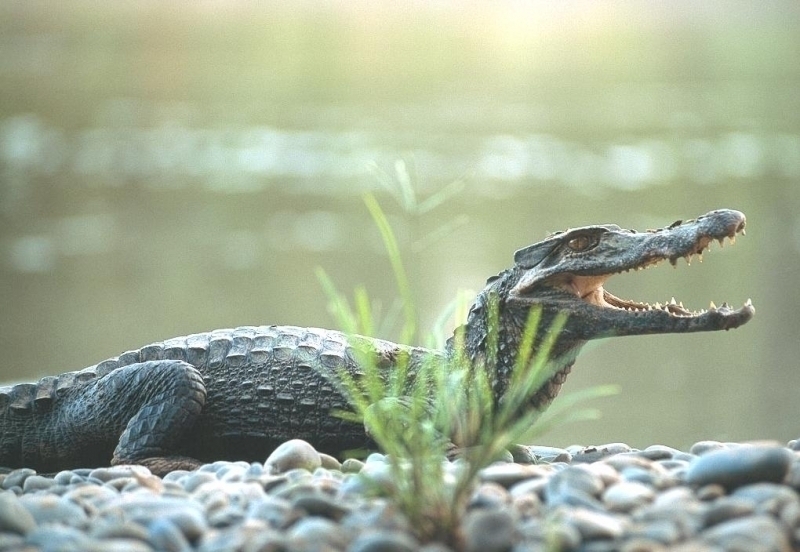 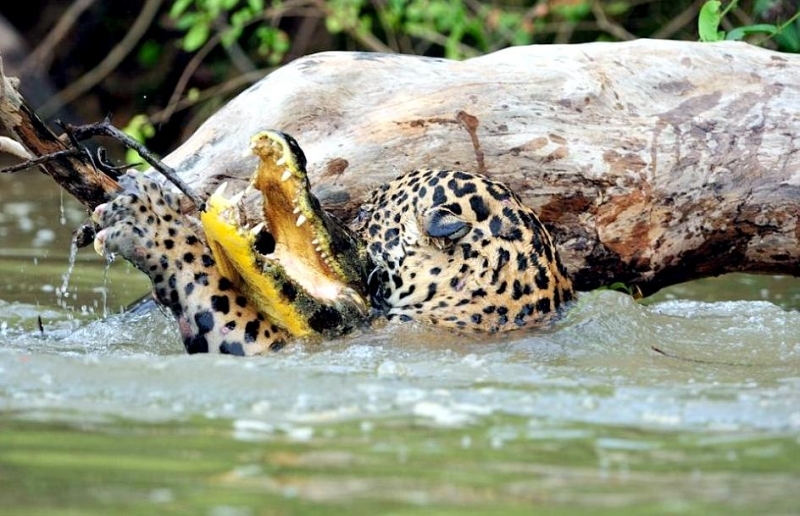 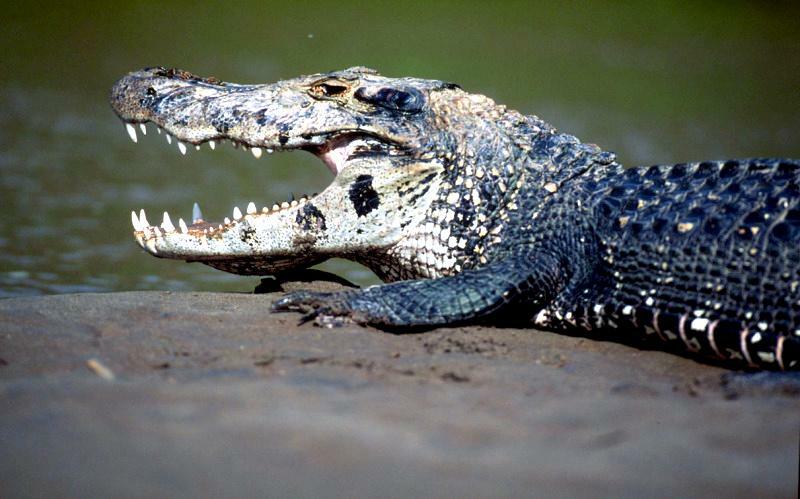 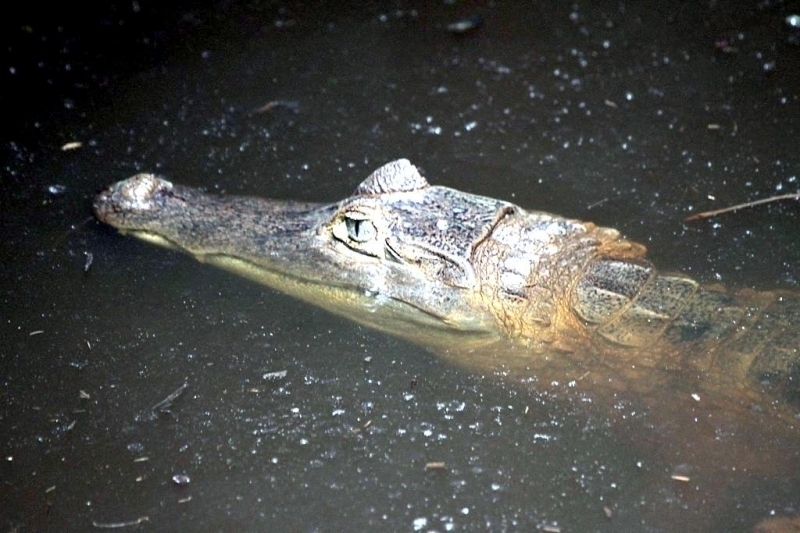 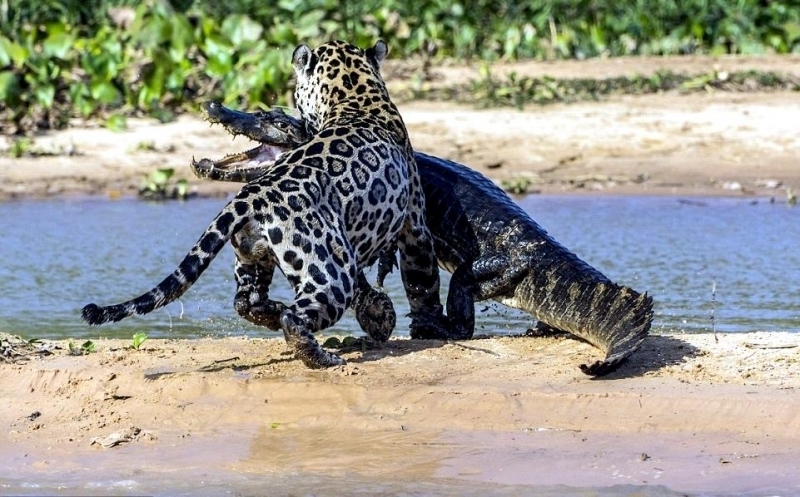 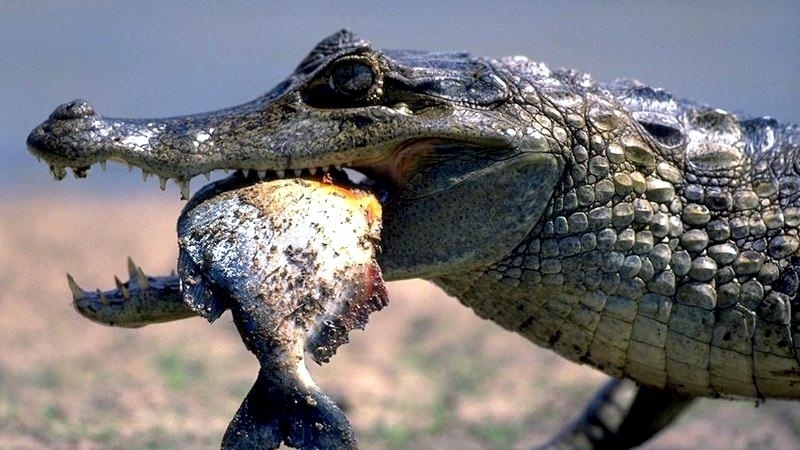 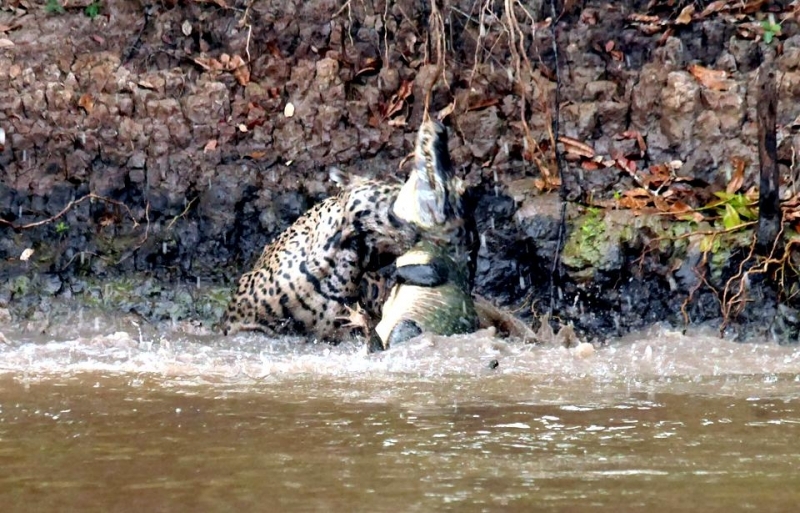 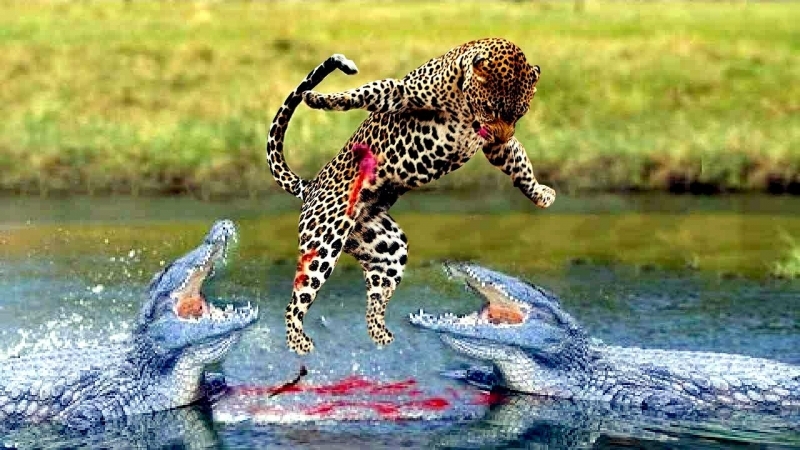 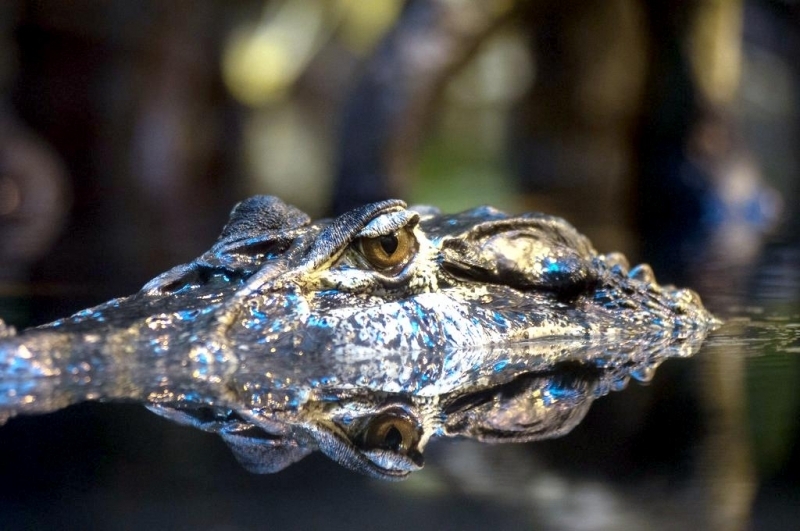 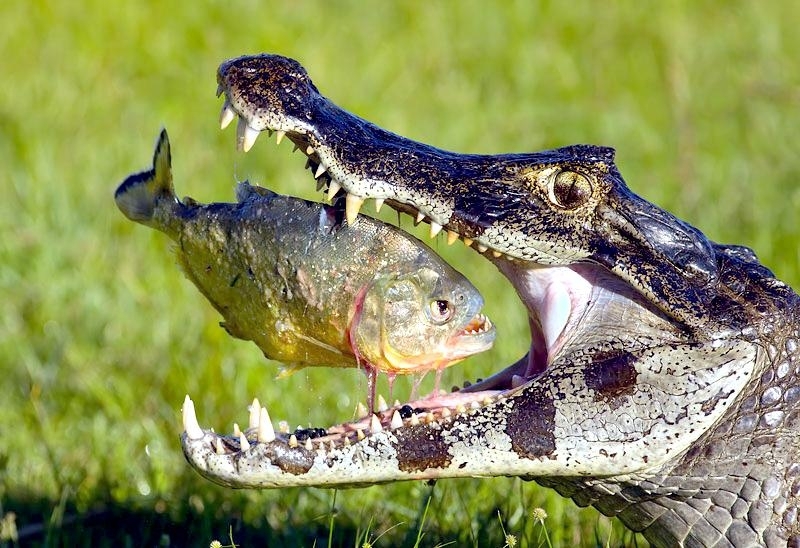 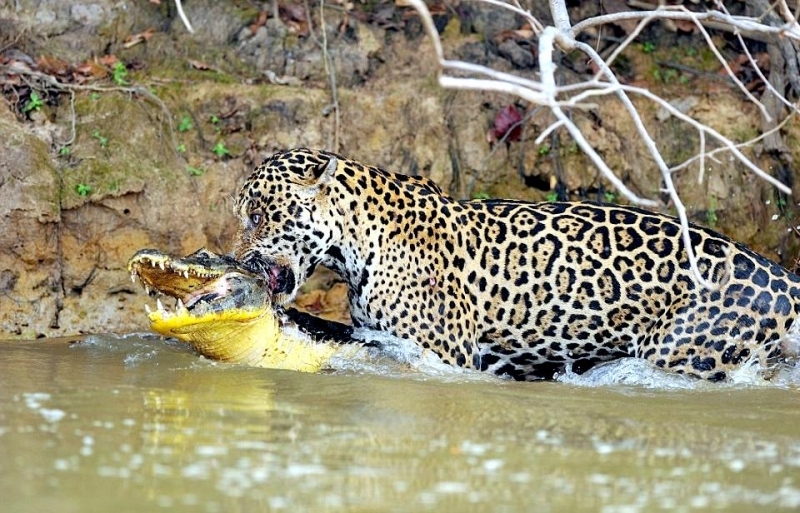 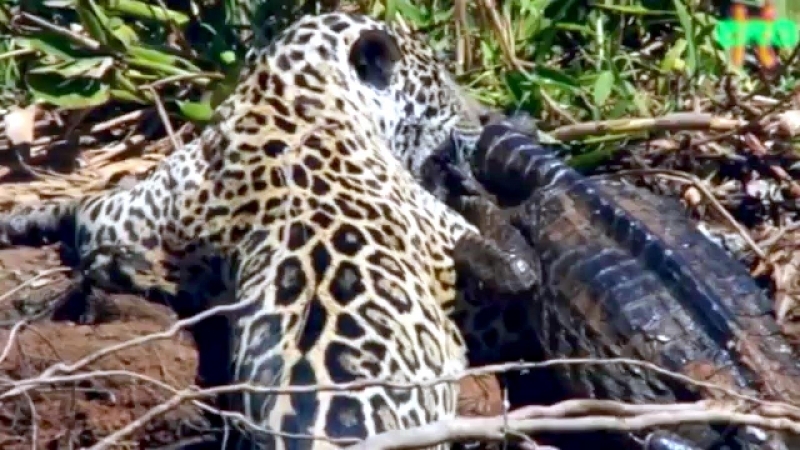 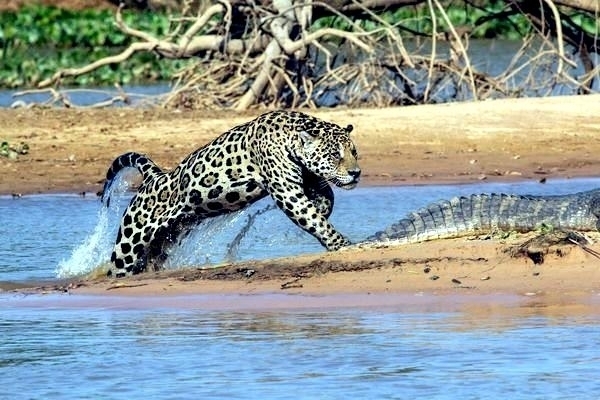 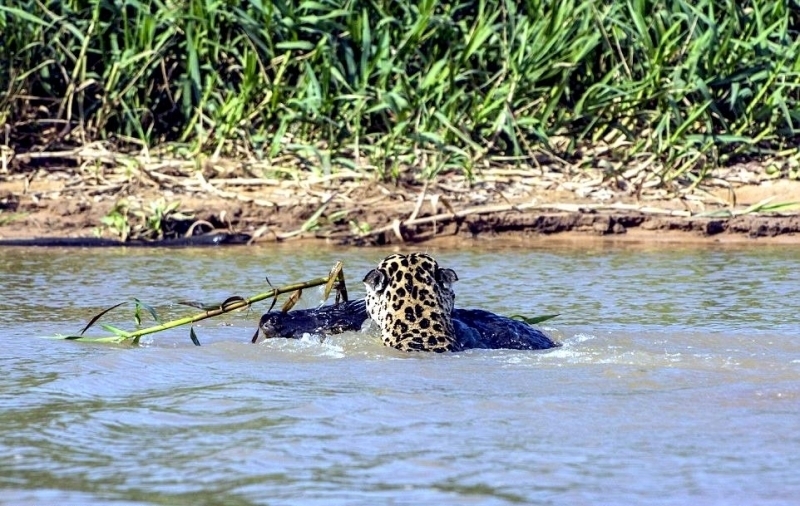 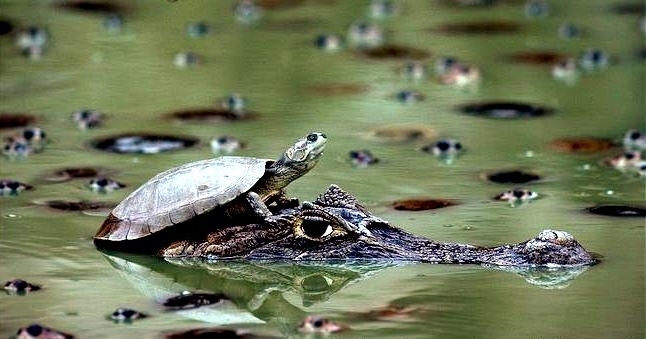 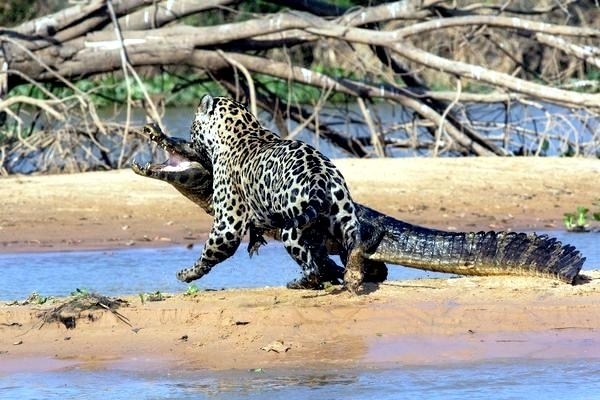 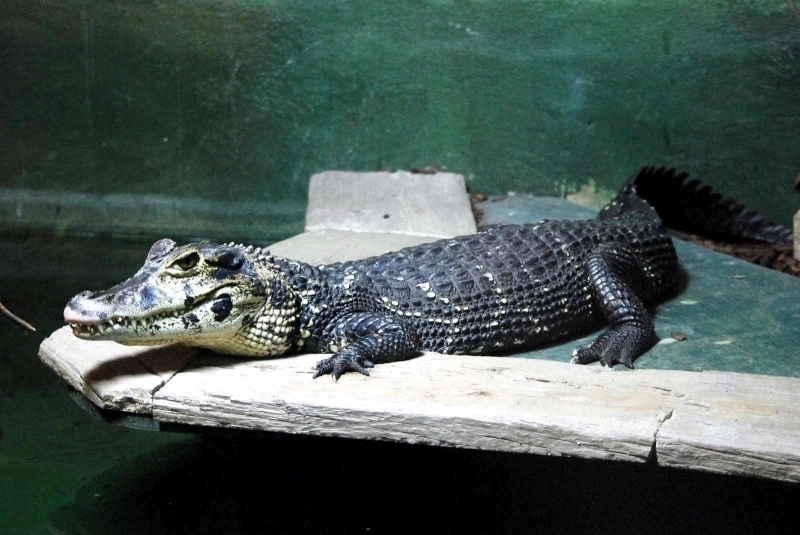 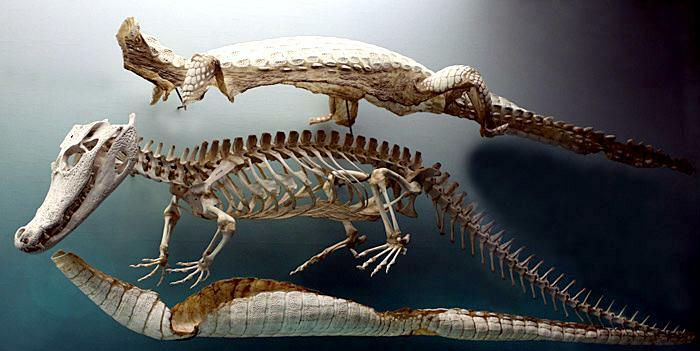 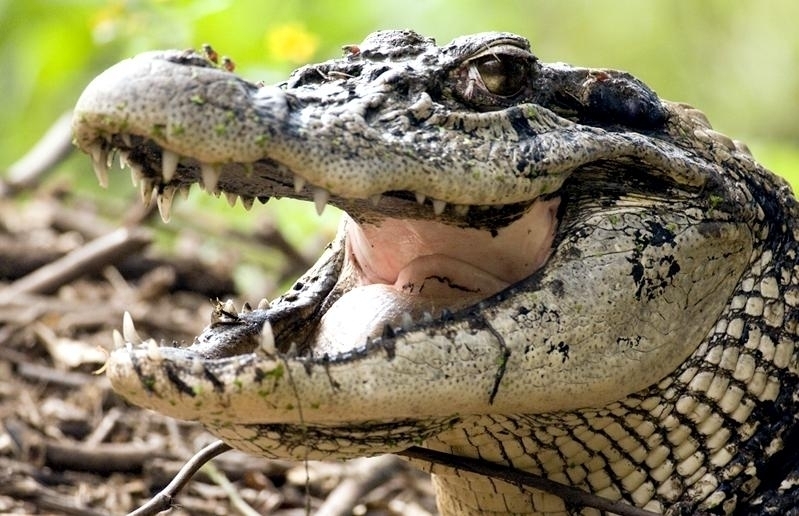 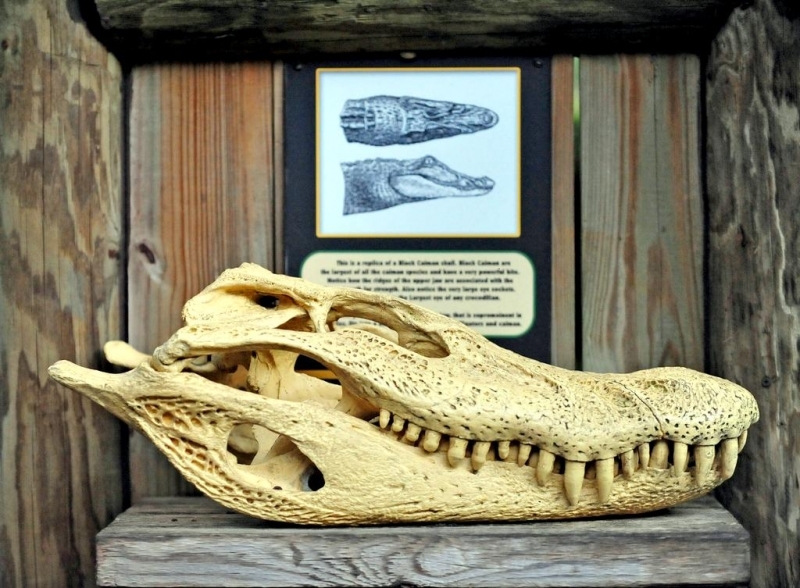 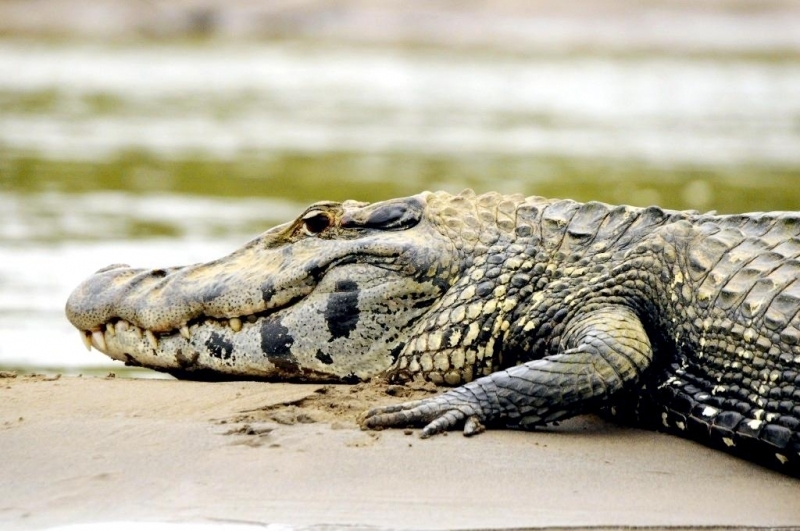 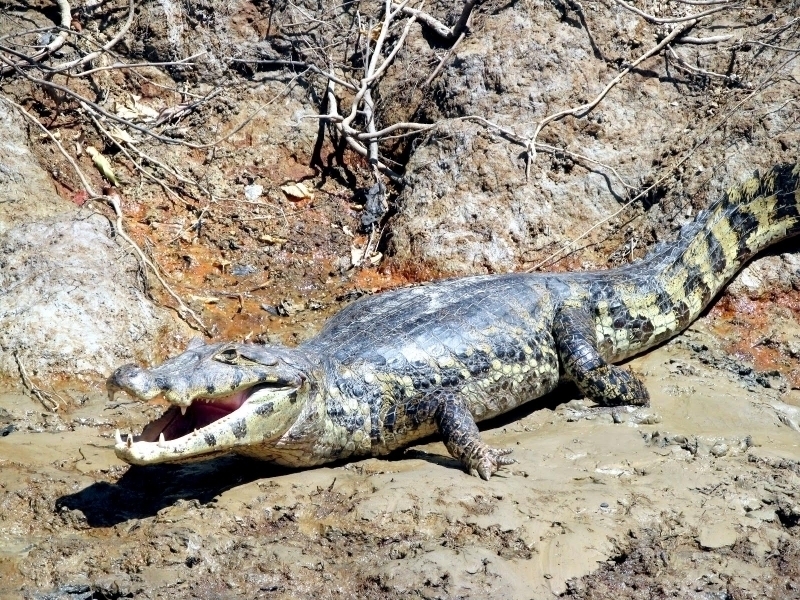 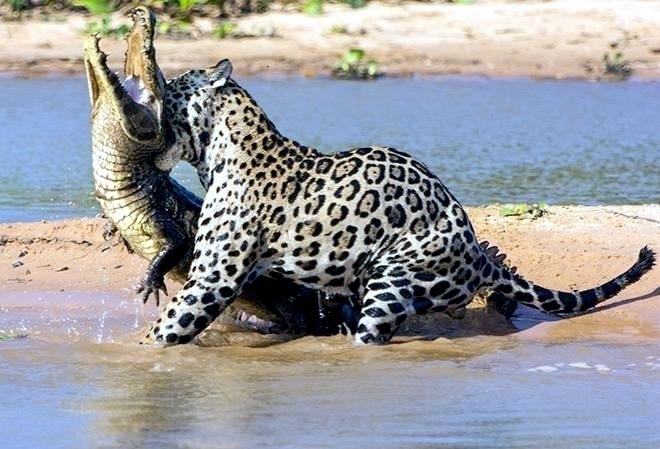 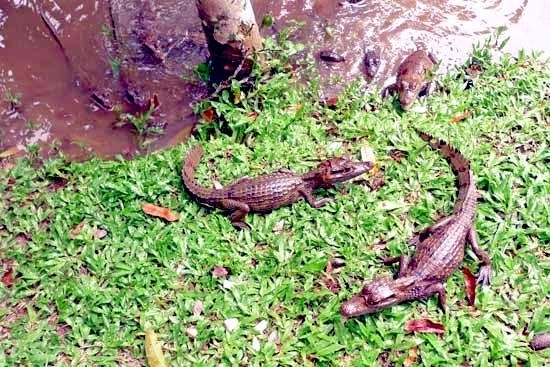 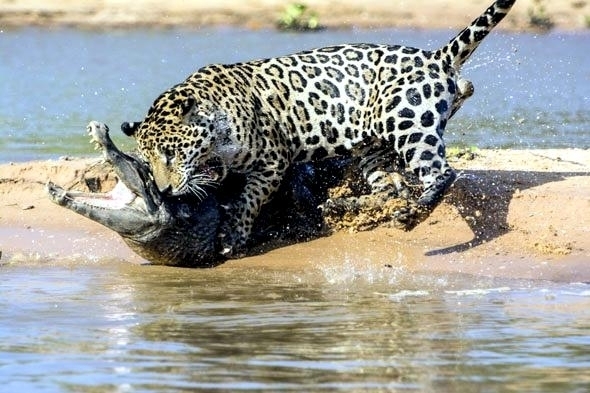 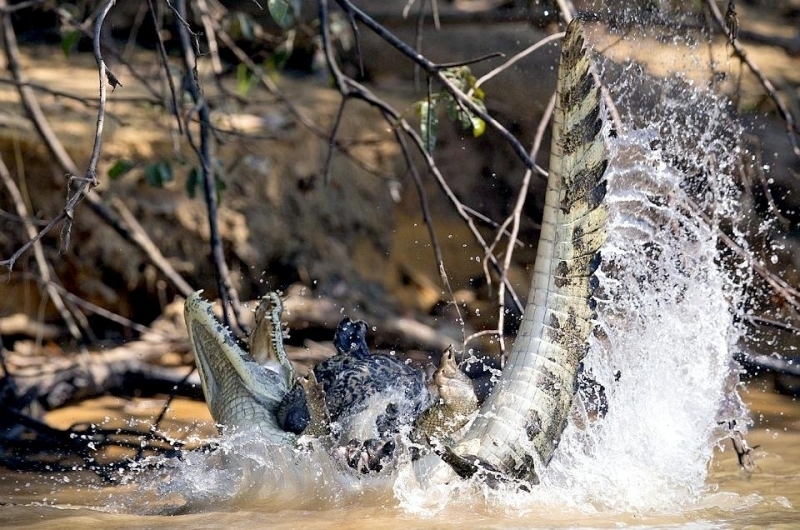 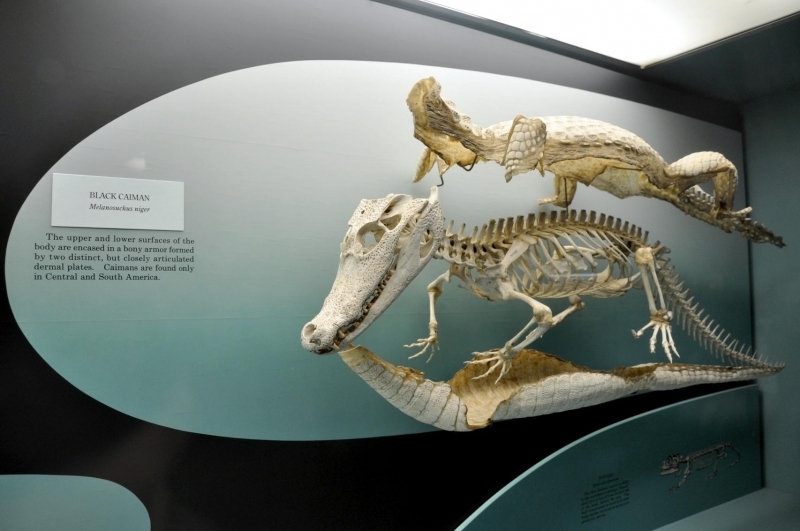 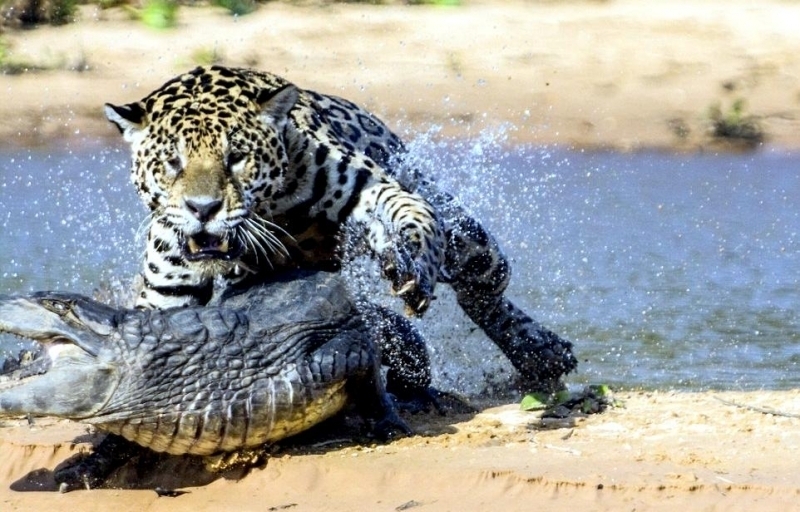 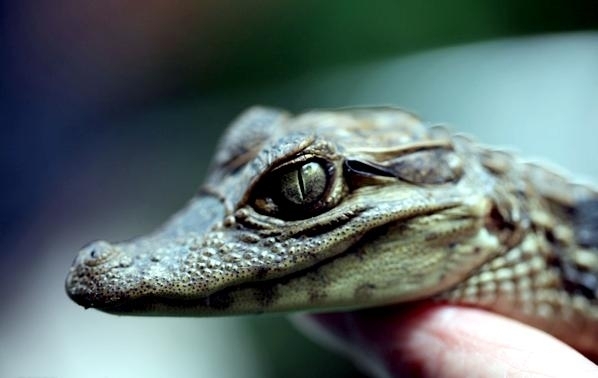 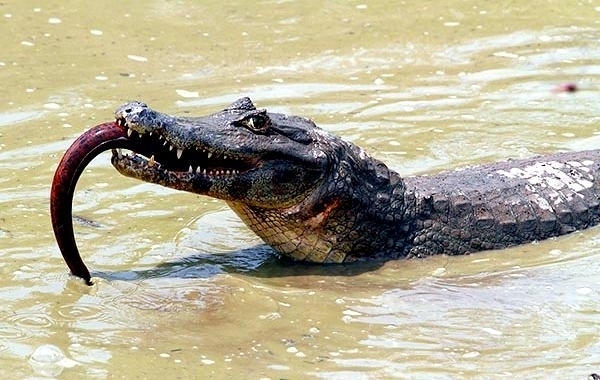 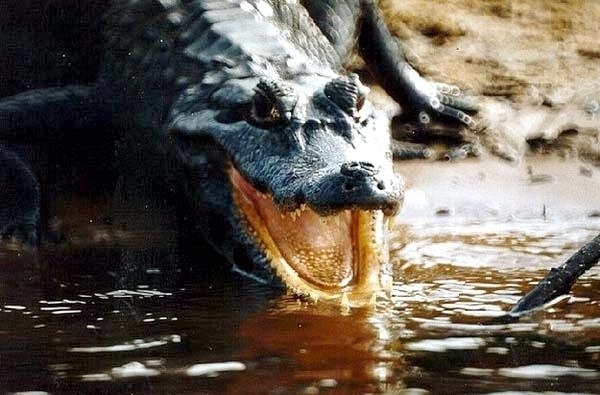 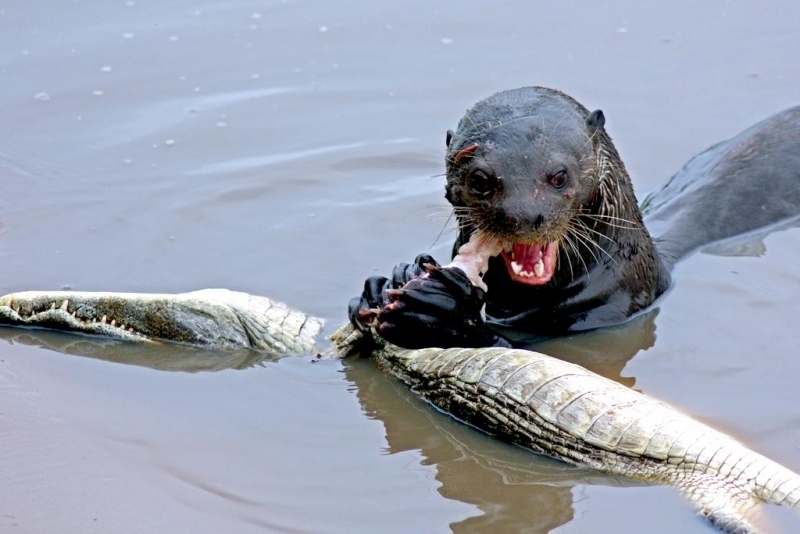 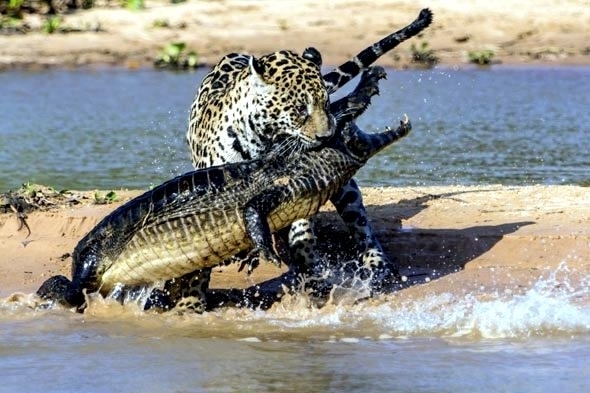 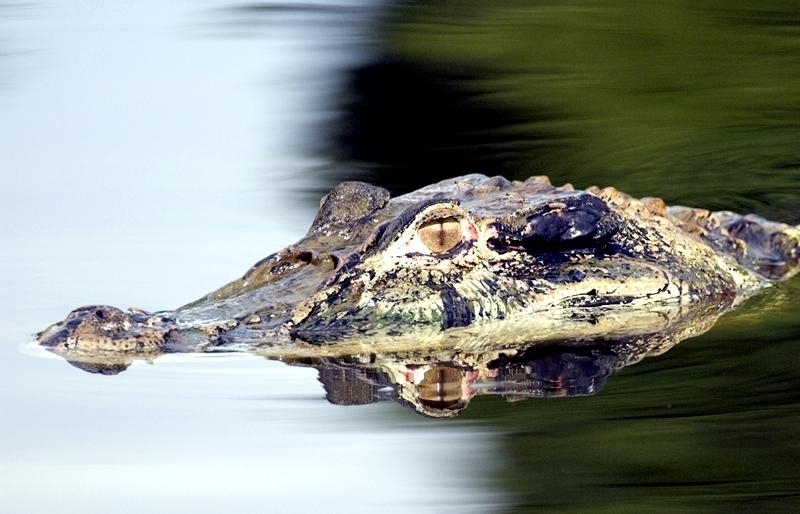 Fish comprises the major part of the Black Caiman’s diet particularly catfish and the much-feared piranha, but adult Black Caiman also tackle much larger prey such as capybara, turtles and deer. 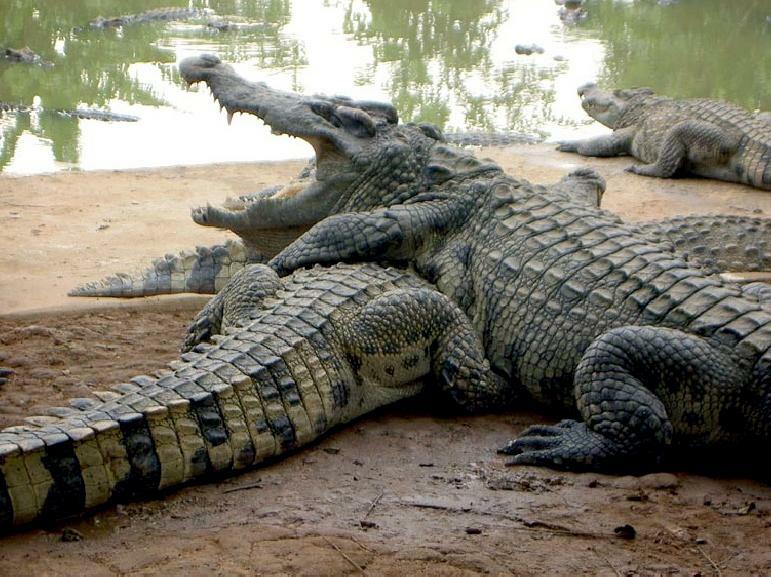 Domestic animals such as dogs & pigs may be taken by large adults and there are even reports of people being the victim of an attack. 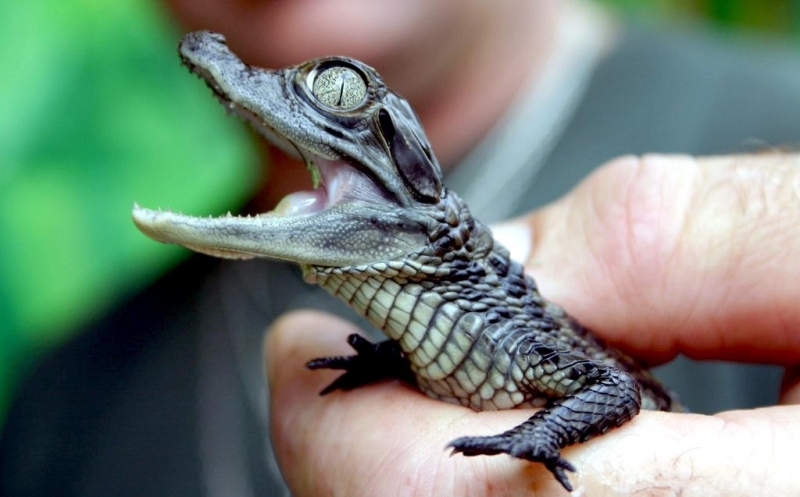 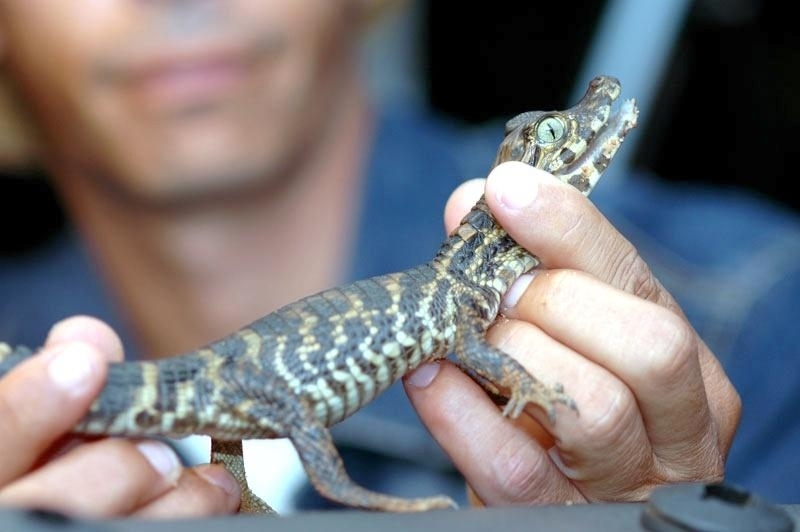 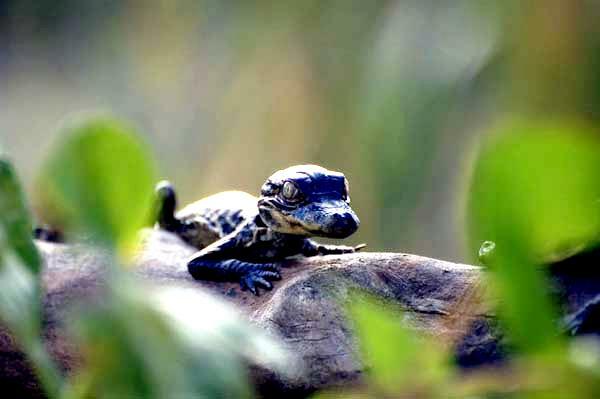 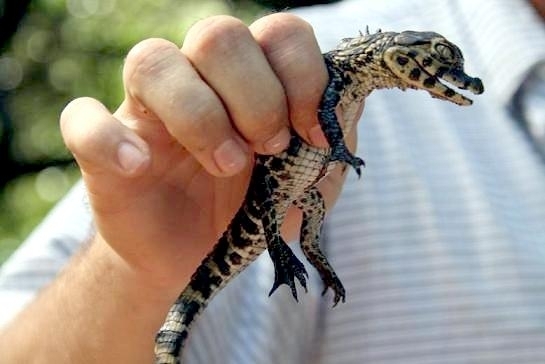 Juvenile Black Caiman stick to smaller foods including crustaceans as well as other invertebrates such as snails & fish. 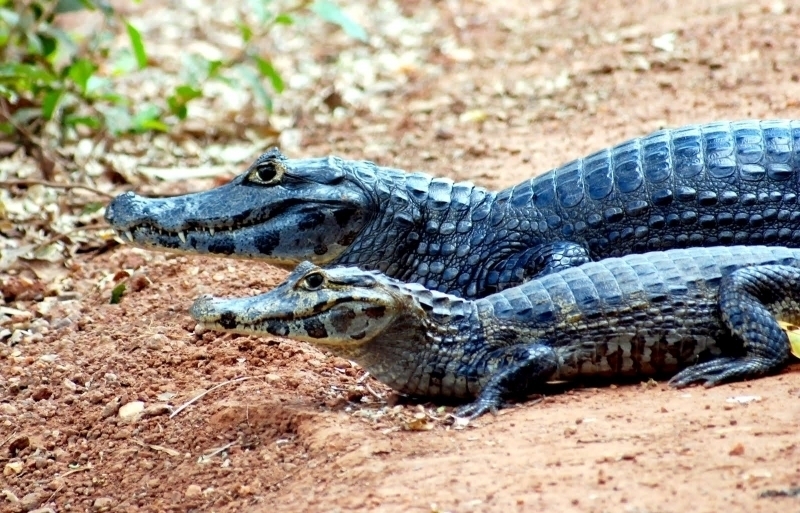 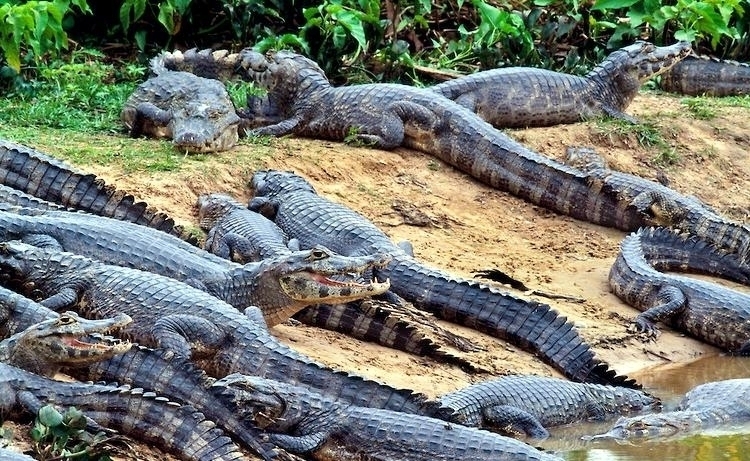 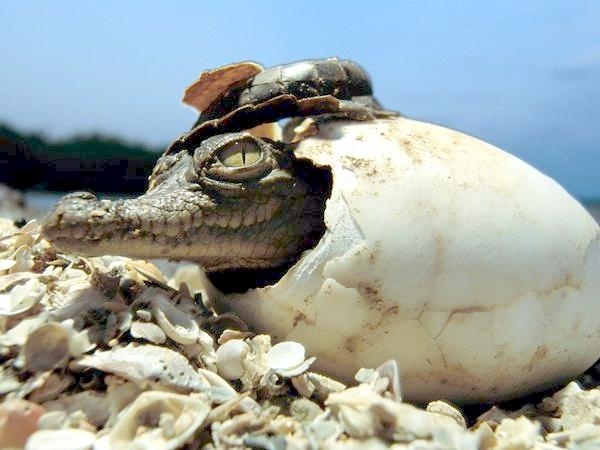 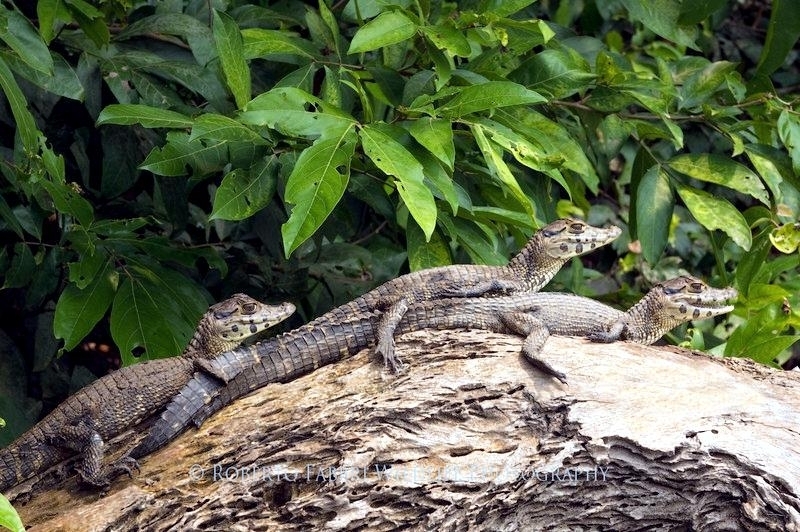 Black Caimans get their name from the extinct Caribbean language word used for these neotropical crocodilians “kaiman”. 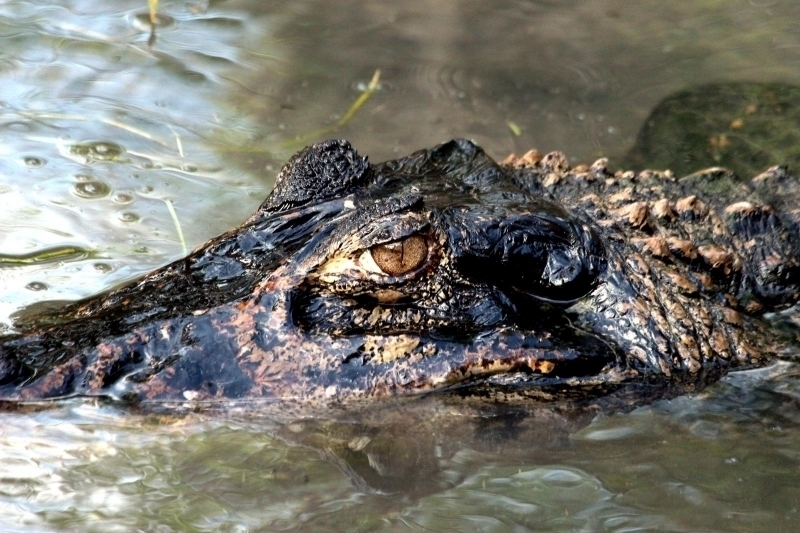 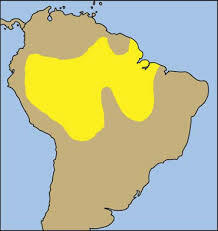 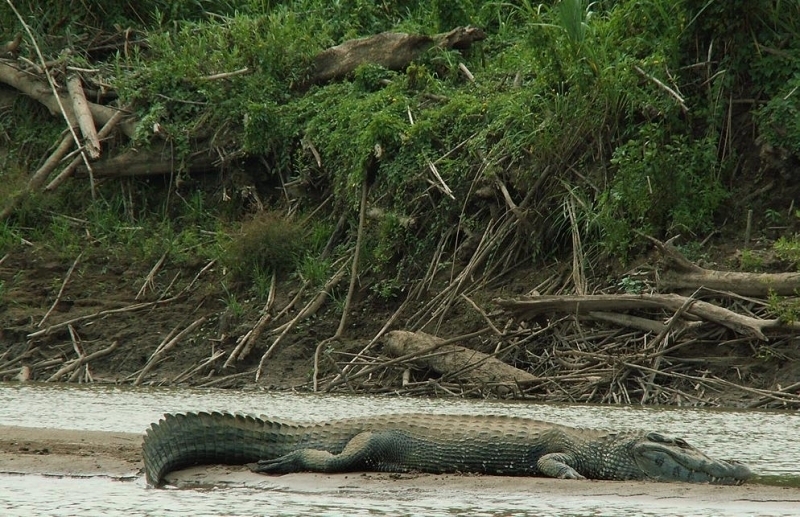 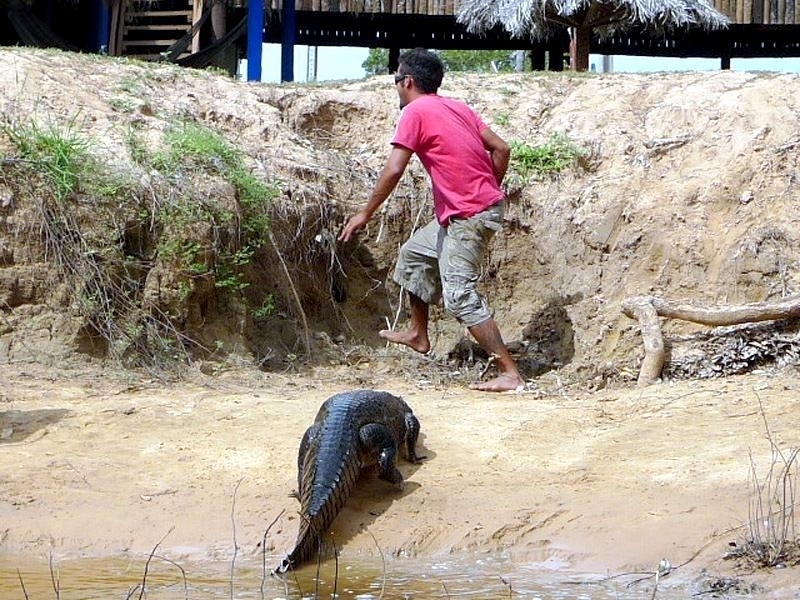 Black Caimans are found throughout much of the Amazon Basin. 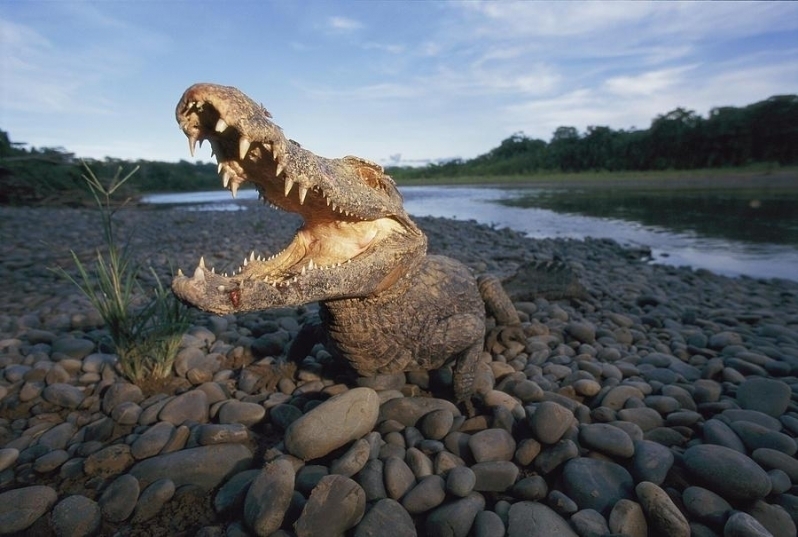 Their range includes much of northern & central South America although these animals are far less common now than a few decades ago. 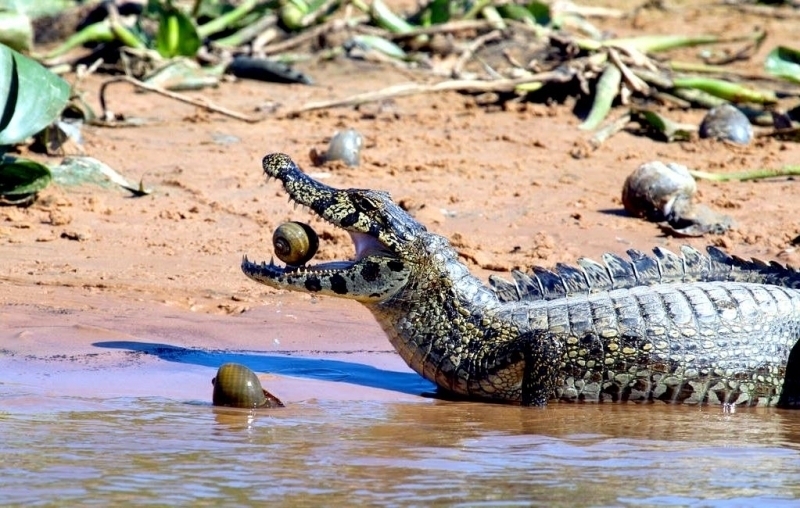 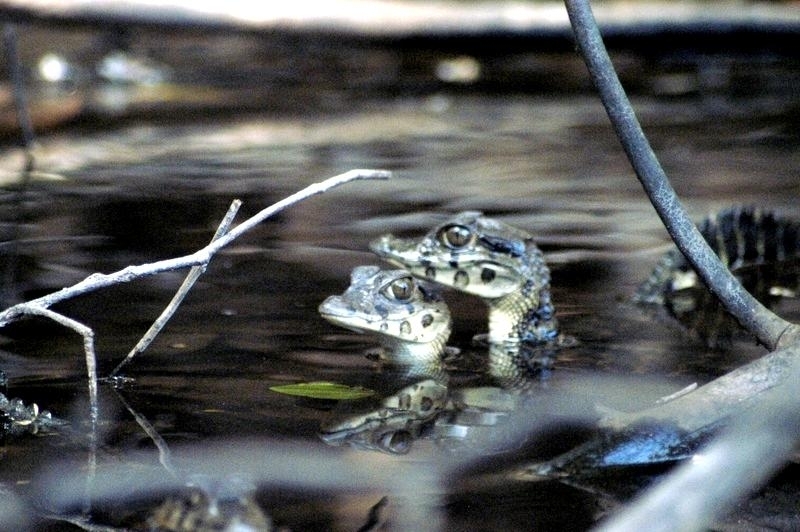 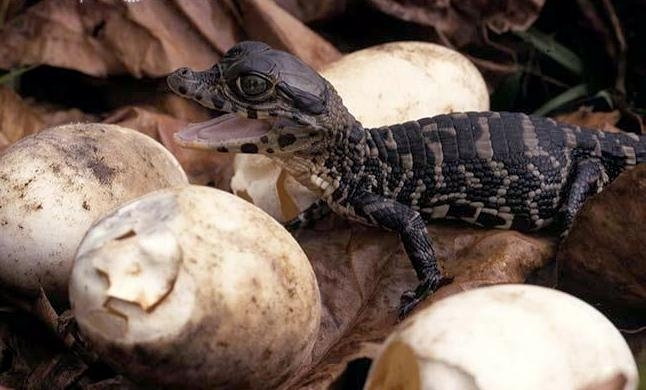 Female Black Caiman are thought to start nesting during the dry season when water levels fall and fish are forced to congregate in shallow pools, providing an easy & plentiful meal. 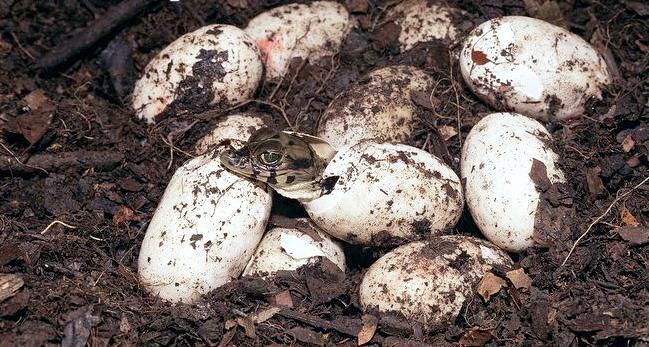 Plant material is used to build a mound nest measuring about 1.5 meters across, into which a large clutch of up to 65 eggs are laid. 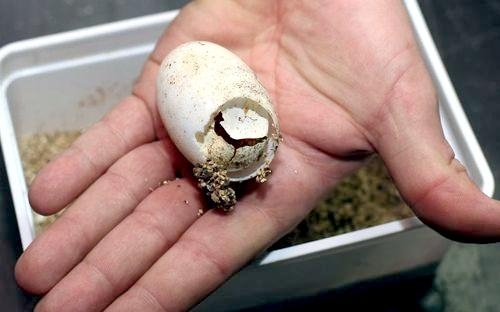 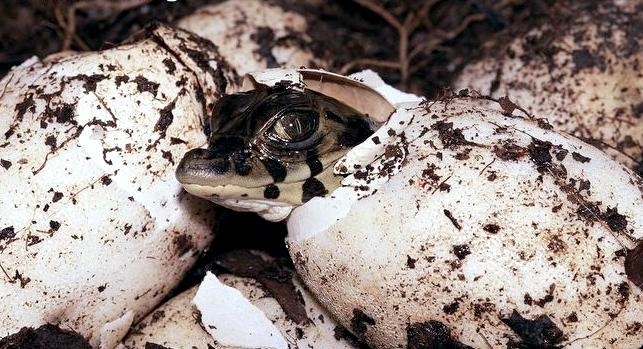 The female will remain close to the nest, waiting for between 42 and 90 days until the eggs begin to hatch, before opening the nest to assist with the hatching process. 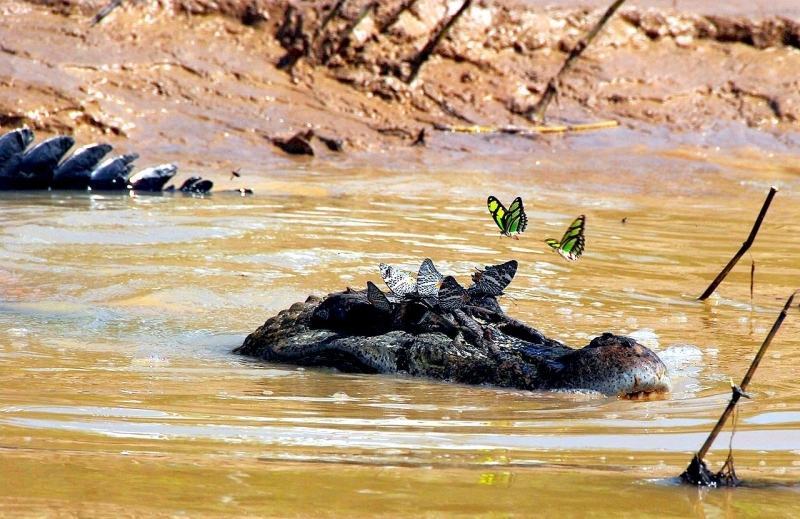 As many females often nest within close proximity, large numbers of hatchlings all emerge at once at the beginning of the wet season gaining some safety in numbers. 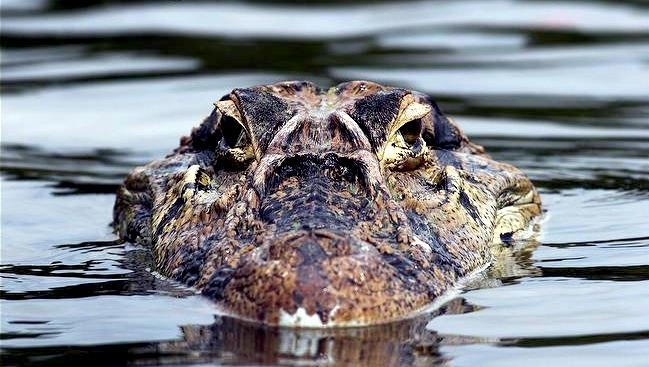 This impressive aquatic hunter is the largest of all alligator species, with reports of individuals measuring 6 meters. 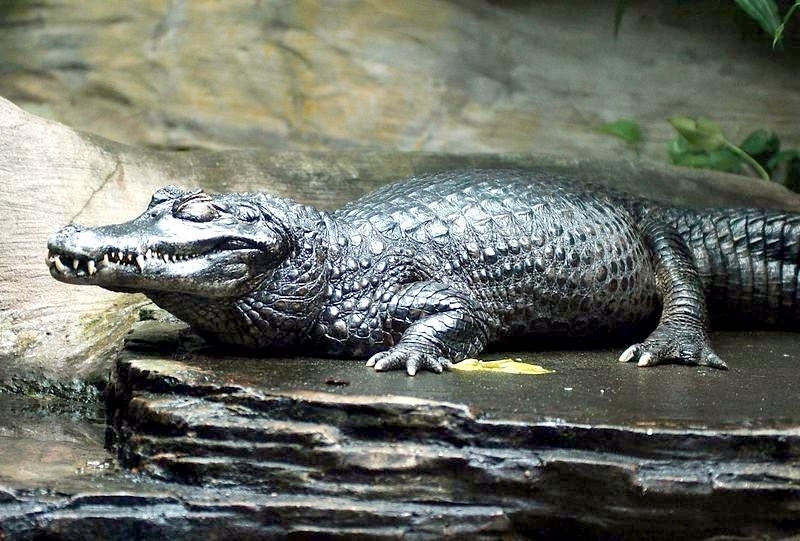 The Black Caiman superficially resembles the American Alligator and as its name suggests, its protective armored skin is dark in color. 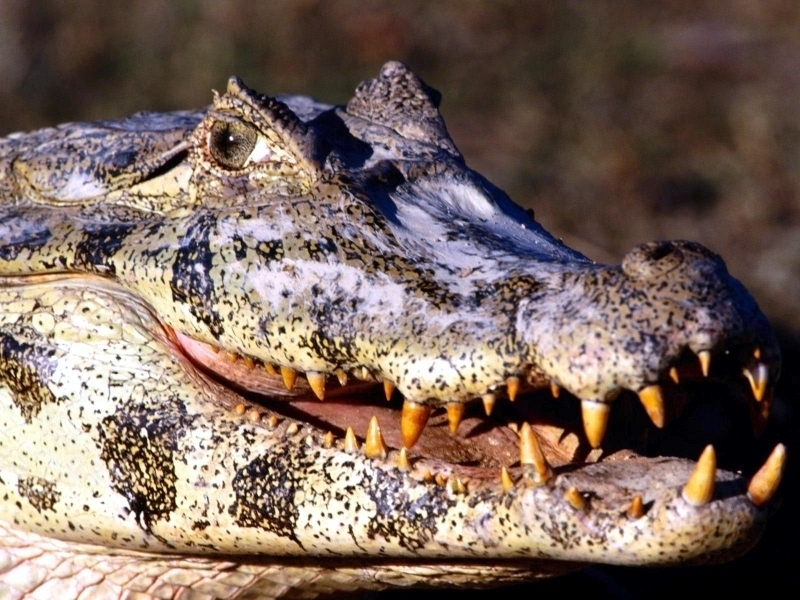 Pale yellow or white bands of dots pattern the sides of the body, while the lighter grey head has dark bands across the jaws. 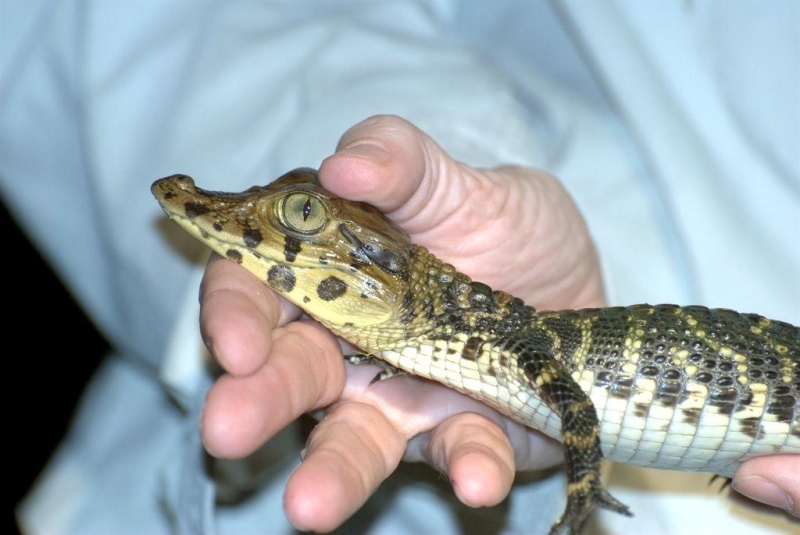 As the Black Caiman matures, this banding gradually fades. 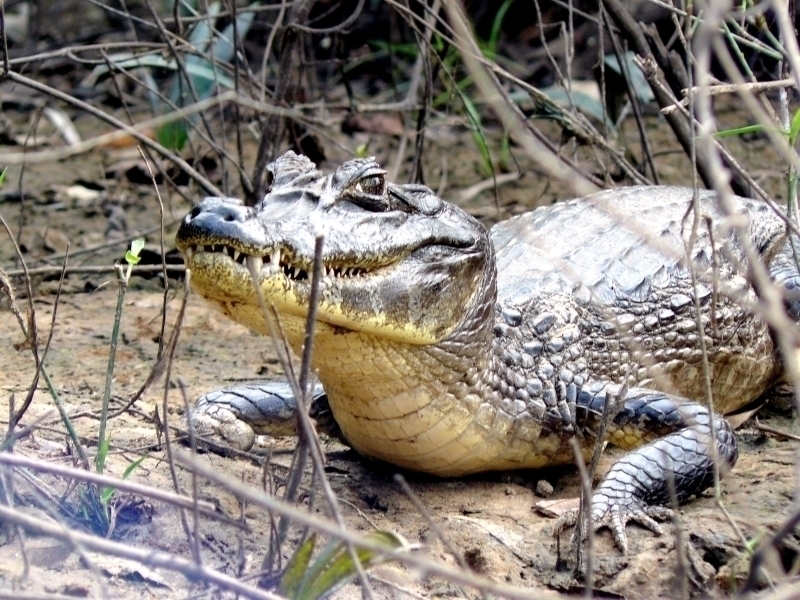 The snout is fairly wide at the base but becomes rather narrow & pointed and a bony ridge extends from above the large eyes, down the snout.